In 4th inning, Evan Skoug (TCU) celebrates at home plate after hitting a three-run home run in Team USA's 10-2 win over Japan. 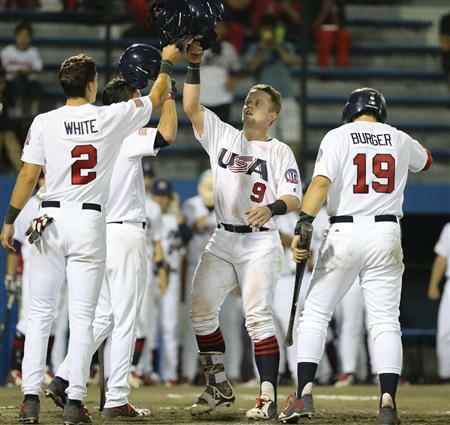 - Home runs by Evan Skoug (TCU) and TJ Friedl (Nevada) highlighted a strong day at the plate for the USA Baseball Collegiate National Team as its offense finally got on track in a 10-2 win over Japan on Saturday at Kusanagi Stadium. With the win, the U.S. has come back from two games down to tie the series at 2-2. The fifth and final game, which will determine the series, is set for 6 p.m. local time/5 a.m. ET on Sunday. University of Missouri right-hander Tanner Houck will get the nod on the hill for Team USA while Japan will counter with right-hander Yuya Yanagi who struck out 12 in seven shutout innings in game two. After managing just two runs on 11 hits over the first three games of the series combined, the U.S. offense erupted on Saturday with 10 runs on 12 hits. In addition to the longballs by Skoug and Friedl, Jake Burger (Missouri State) also had a nice day at the dish, going 3-for-4 with a double and a couple of runs scored. Jeren Kendall (Vanderbilt) and Brendan McKay (Louisville) each finished with a pair of hits as well. Team USA got the scoring started early on Saturday as McKay reached on an error and Burger followed with a cue-shot down the right-field line for a double. A wild pitch then brought McKay home from third and Evan White (Kentucky) followed with a sacrifice fly to plate Burger and stake the U.S. to a 2-0 lead. That advantage skyrocketed two innings later as a three-run blast by Skoug highlighted a six-run frame in the fourth. In all, the U.S. sent a total of 10 men to the plate with Kendall and Seth Beer (Clemson) knocking in runs during the onslaught as well. Japan finally cracked the scoreboard in the eighth when it tallied a pair of runs to break a streak by the U.S. pitching staff of 21.1 innings without allowing a run, dating back to the fifth inning of game two. Friedl made sure Team USA got those two runs right back, however, crushing a 2-2 offering into the seats in right in the home half of the inning to account for the game's final score. Lost in the offensive effort was another stellar outing on the mound by the U.S. pitchers. Starter Kyle Wright (Vanderbilt) set the tone with six strikeouts over four shutout innings before handing the ball over to Ricky Tyler Thomas (Fresno State) who faced just one over the minimum in his three near-perfect frames. Darren McCaughan (Long Beach State) recorded the final four outs to close out the win. "Obviously we played very well. We made it look easy offensively. We put the ball in play against the same left-hander who cut us up and pitched very effectively with six strikeouts last night. Our guys were up to the challenge, stayed behind the ball and generated some power. It was a complete offensive game. To be able to put up six runs in that fourth inning and get that kind of a lead against a good baseball team felt really good." "We are excited. We knew it was a tremendous challenge to come here and try to win a series in Japan against a very good Japanese team. After going down 0-2, our guys have fought their way back and put themselves in position for a great opportunity. We know we are going to see two very good pitchers tomorrow who are fresh so it will be a different challenge. The scoreboard will say 0-0 and may the best team win. We hope that is us and our guys will be up for the challenge. They will play awfully hard, I know that." "I thought I did fine and did what I was supposed to do and that is throw up as many zeroes as possible. It wasn't pretty at times, my fastball command wasn't great, but I have to give a lot of credit to Evan (Skoug). He did a great job of talking me through it and helping me make pitches when I needed to." "It felt pretty good, really good actually. I've been working a lot on my swing in batting practice with the coaches and I finally found it over the past couple of days. I have just started swinging at good pitches and as soon as I hit it I had a feeling it was going out. It's a pretty special place to hit a home run knowing that guys like Babe Ruth and Lou Gehrig have played here. It was just a very special feeling."